FIFTY YEARS AGO, in 1961, Washington state bowhunter Glenn St. Charles launched the Pope and Young Club, the major records keeping organization for archery-killed big game. His goal was to give bowhunting credibility in the eyes of state game departments and the general public. The P&Y Club has achieved that goal beyond Glenn St. Charles' wildest expectations, and on April 6-10, the Club celebrated its 50th Anniversary during its 27th Biennium Awards Banquet and Convention in Rochester, Minnesota. At the center of the celebration was a tribute to St. Charles, who died in 2010 at the age of 99. Even though he was physically absent from the biennial convention for the first time in 50 years, his spirit and influence clearly live on as seen in the achievements of the Club and its members. Bowhunters entered a record 8,717 animals into the P&Y record book during the 27th biennium, ending December 31, 2010. Of these, 102 of the largest were on display at the convention, including three new world records: Alaska-Yukon moose (249 1/8) taken by Real Langlois near Earn Lake, Yukon; nontypical Coues deer (127 1/8), taken by Nathan LaCost in Gila County, Arizona; and typical mule deer (205 0/8), taken by George Harms near Hermosillo, Mexico. That just scratches the surface of a memorable 50th Anniversary celebration. 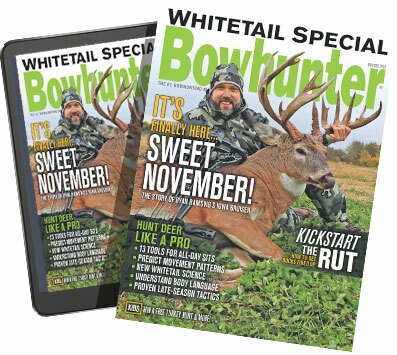 For a complete report, don't miss the September issue of Bowhunter, which hits the newsstands the first week in August.